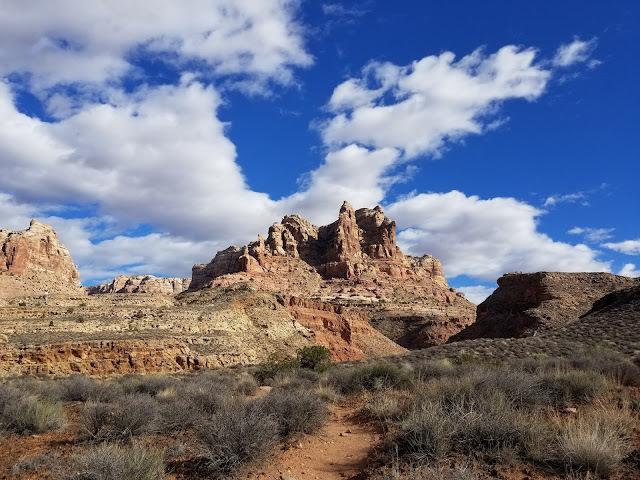 I've been slumming it on the Colorado Plateau for a couple of weeks now. A little backpacking, a little car camping, a little day hiking, and good times with friends. And in the course of those two weeks, winter has arrived. When we entered Dark Canyon, it was fall. When we left, it was winter. I don't exactly know why it's called Dark Canyon. 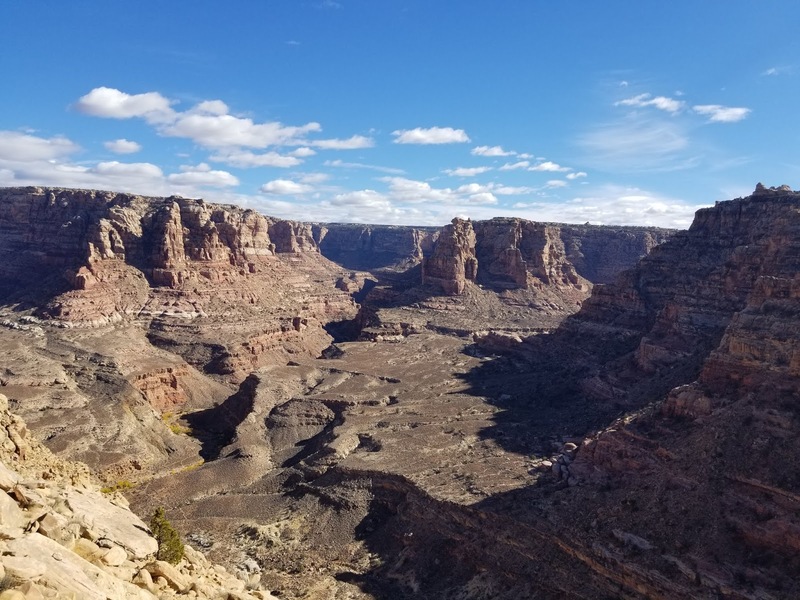 Perhaps it's the gray slate that forms the lower layers of the canyon. Perhaps it's the depth of the imposing gorge. Or perhaps, somebody a century ago just had a really bad day down there. At any rate, I had been through Dark Canyon in 2015 as part of the Hayduke Trail. Dark Canyon is one of the scenic highlights of the route and a true gem of the Colorado Plateau. Of course, that was the infamous trip on which I lost my maps and ended up navigating overland almost entirely by memory. 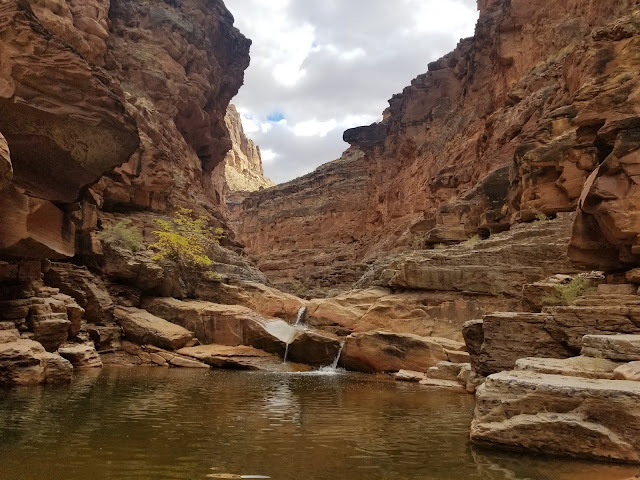 Needless to say, I wasn't in the state of mind to enjoy Dark Canyon as much as I otherwise would have. 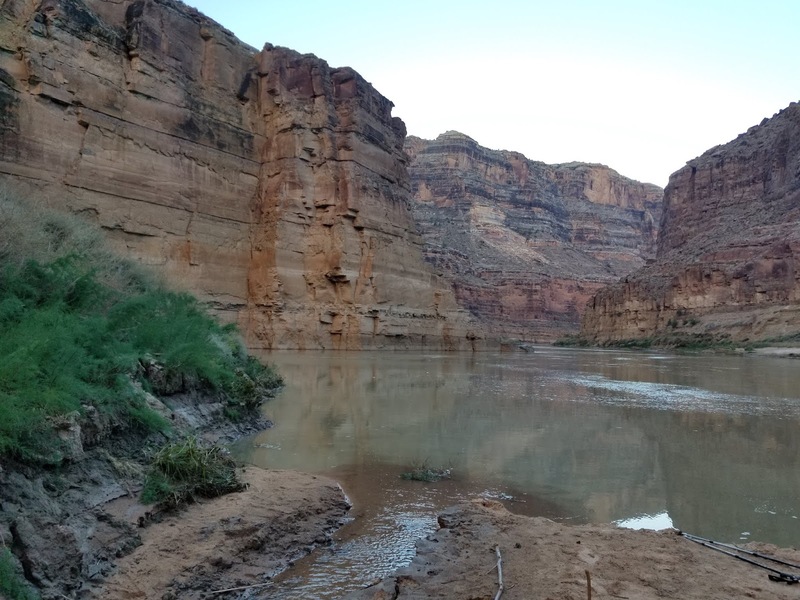 And I really, really wanted to go back and hike down to its confluence with the Colorado River. 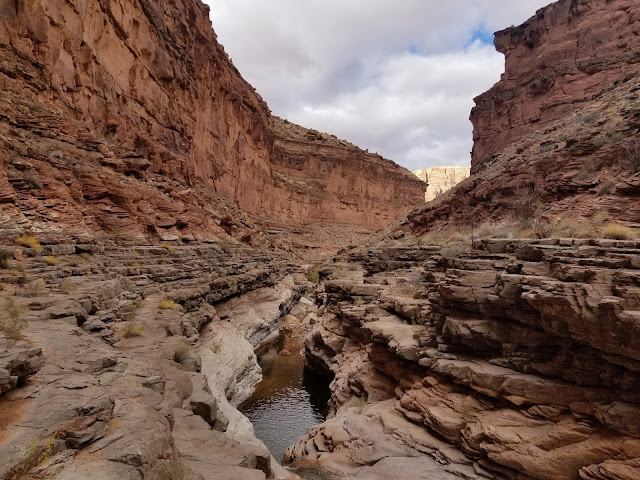 So when long-time pen pal Paul Mags emailed me to suggest that we do a backpacking trip, we both jumped at the chance to do this section of Dark Canyon. Mags is an experienced outdoor adventurer who recently moved to Utah (as all smart outdoors folks should). From his house in Moab, it was a quick three hours to get to one of the more out-of-the-way destinations in the state. The trailhead is an unassuming parking space ten miles down a dirt road of so-so quality. Quickly though, the dirt road we were walking down gave way to a trail-like substance. A cairned route, really, down 1,500 feet in less than a mile. 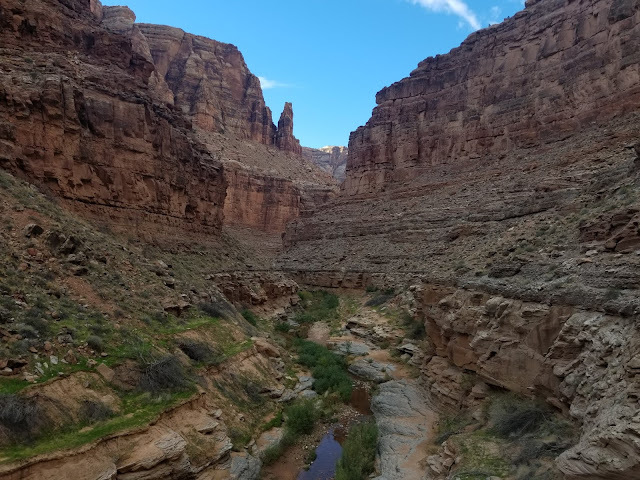 The sprawling canyon system opened before us, before swallowing us as we descended into the gulch. In the bottom of the canyon, we found a cheerfully trickling stream and the trademark rock ledges for which Dark Canyon is famous. We headed for the confluence with the Colorado. What a place! Despite a small amount of annoying bushwhacking, we soon reached the River, channeled between the soaring sandstone walls of Cataract Canyon. We camped nearby. We could hear beavers at night as they noisily splashed up Dark Canyon wash. I even caught a glimpse of one when I woke up in the middle of the night. The next two days were spent exploring the various nooks and crannies of Dark Canyon and a couple of its tributaries. 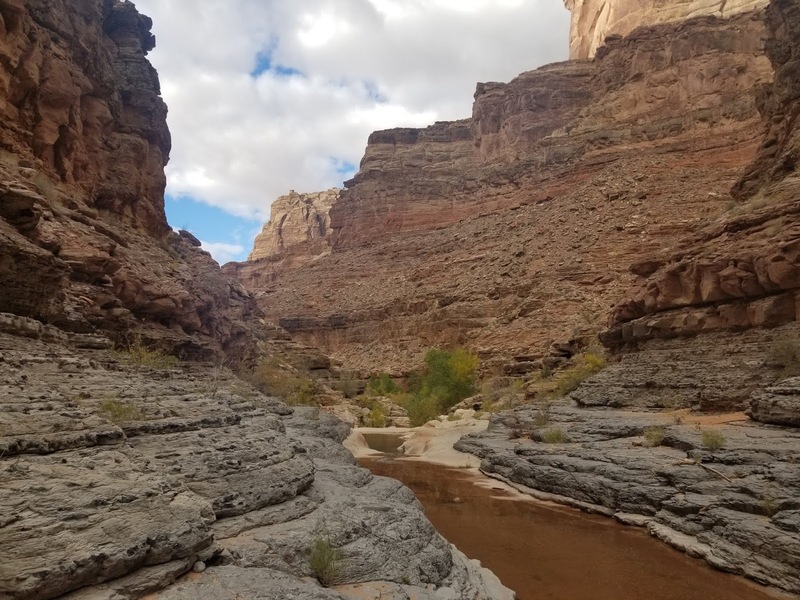 There were a few thigh-deep spots, some bushwhacking, and plenty of backtracking and routefinding on the various rock ledges. There was no trail per se, just a network of social trails and cairned routes that started and stopped seemingly at random. 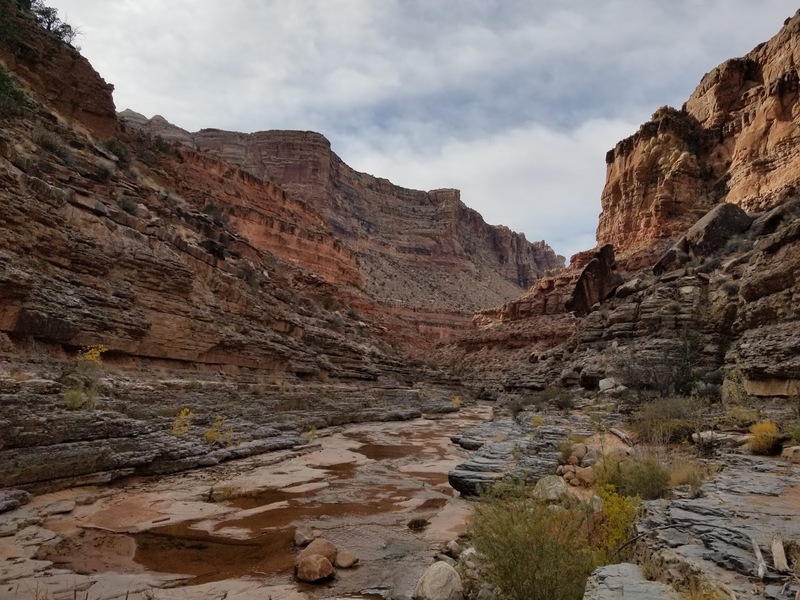 In no particular hurry, and with no particular destination in mind, we meandered our way first upstream, and then downstream, taking a long lunch and camping early each day. There's not too much daylight at this time of year. The season for doing big miles has passed. Now is the time for sauntering and for exploration. On the penultimate day, we encountered something special. As we sat down for lunch on some rock ledges, I heard a rustling in the bushes on the other side of the stream. A massive bull elk ran a few dozen yards in the other direction, then turned. And stood his ground. Obviously the alpha in this neck of the woods, he was not going anywhere. He was unafraid. We were in his territory. He must have stood there for a half hour, occasionally flexing his legs as they grew tired, nostrils flaring in displeasure. We finally snuck over a hillside, out of his view, and made our way rather stealthily down canyon until we were several hundred yards away from him. I hope you're happy, Mr. Elk. All too soon, we made our way back up the steep climb to the canyon rim. Back to the open expanses. Back to a cold, howling wind. The nights are getting cold now, down into the teens. The last few golden aspen leaves are dropping. Winter is coming quickly. This is the last gasp of fall. What a way to spend it.